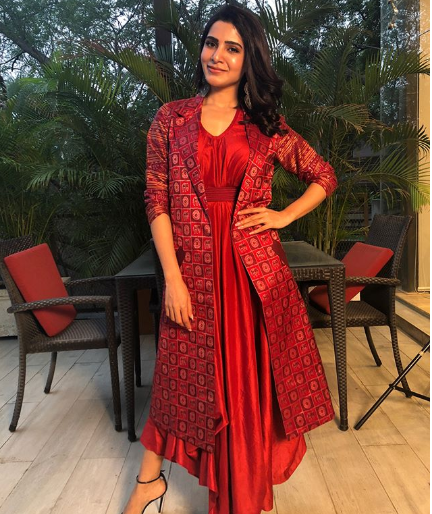 The gorgeous Samantha was clicked wearing a red asymmetric dress paired with matching printed jacket by Shruti Sancheti. The gorgeous Samantha Akkineni recently inaugurated a restaurant at Punjagutta, Hyderabad. The actress looked stunning like always and was seen enjoying some delicious food at the restaurant launch. The pretty Samantha was clicked wearing a red asymmetric dress paired with matching printed jacket by Shruti Sancheti. She rounded up her look with black strap heels and drop earrings. She looked stunning and its so amazing to know how she carries every look of her with grace and confidence. On the work front, Samantha Akkineni awaits the release of ‘Seema Raja’, in which she’s paired opposite Sivakarthikeyan. This will also be the first time for this pair to associate for a film together. The film has been majorly shot in and around Tenkasi. Samantha has trained for her role in this film by learning the weapon-based ancient art form Silambam. 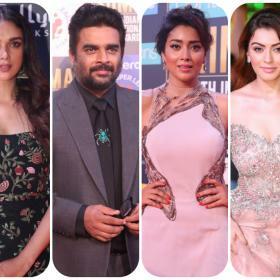 The actress had even posted a video of practicing Silambam on her social networking page. Seemaraja is touted to be a rom-com and is set in a rural backdrop. What’s the hype about this woman? Gorgeous?? She looks pathetic! How many days will this post be on PV? Sheesh! There are other South actresses too! omg whats with her brows?